Album launch event for the new Rothko album, due out on November 21st, A Young Fist Curled Around A Cinder For A Wager. This album marks the first Rothko line-up to feature Mark Beazley and Johny Brown of Band Of Holy Joy, with visuals on the night by Inga Tillere. 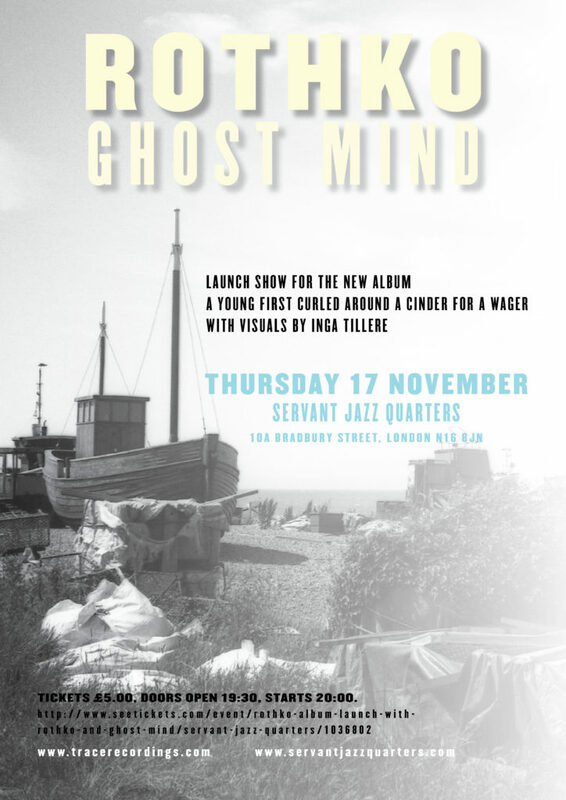 Support comes from the improvisational trio, Ghost Mind, featuring Jon Andriessen on guitar and soundscapes, Pete Robson on trumpet/horns and Stuart Wilding on drums and percussion. Mark Beazley founded the group Rothko in 1997, initially as a bass guitar trio, with the line-up shifting and evolving in the intervening years to a bass duo and viola, a seven piece band, and then settling from 2004 until 2010, on the line up of Mark Beazley and Michael Donnelly on bass and brothers Ben and Tom Page on keyboards and drums. They released a host of singles, EP’s and albums on Bella Union, Lo Recordings, Too Pure, Fierce Panda and Beazley’s own Trace Recordings label and toured extensively in France and Belgium. The group disbanded in 2010, until their return in 2014 after being invited to play at the Half Die festival in Rome, this time with just Mark and long serving band member, Michael Donnelly, both on the bass guitar, and they have recently released their first album since 2007 – Discover The Lost. Rothko now has two simultaneous incarnations, the bass duo of Mark and Michael, and also the duo of Mark and Johny Brown of Band Of Holy Joy, who are releasing the first ever album in this line up on November 21st 2016 – A Young Fist Curled Around A Cinder For A Wager. “Rothko have returned, and something is altogether more right with the way of the world.” Linus Tossio, Freq. Ghost Mind consists of Jon Andriessen on guitar and effects, Pete Robson’s horns and Stuart Wilding on percussion. All this combined with a background of found sounds gathered from around the planet. The concept of Ghost Mind was devised while the members were playing together with the Cheltenham Improvisers Orchestra. The idea was to carry on that experimental, improvised sound with an added backtrack – the Ghost – in a more compact trio replacing the Orchestra and creating a soundscape with a space difficult to create in a larger group.